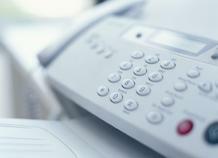 Faxing over VoIP with Sharp Fax Machines. Faxing with Sharp facsimile machines over VoIP should have some success, especially if the machine has a 9600 BAUD rate as its default transmission speed. The other setting, which most machines have as a default is ECM (Error Correction Mode) enabled, which needs to be disabled. VoIP Mechanic recognizes that not every fax machine comes with implicit easy to find instructions for slowing down the BAUD rate to 9600. We have accumulated some information on the following Sharp Fax and Multi-function machines, which could be helpful when faxing over a VoIP connection. The Sharp UX-B20, UX-P115 and UX-P200 are plain paper fax machines that come out of the box with a 9600 BAUD rate setting with a fall back lower negotiated speed if the other fax wants to transmit at a lower speed. Additionally, the resolution is set to Standard, making these machines good candidates for faxing over VoIP. Standard resolution is a the default setting. Press the Function Key and the the Large Selection Key until Option Setting appears. Press it Again, then repeatedly until the ECM selection appears. Using the Key pad select 2 to turn off ECM. Press Stop to exit the settings. By disabling ECM (Error Correction Mode) the fax will keep transmitting even if some data is lost. This will help your faxes to complete over VoIP. How to disable ECM on the Sharp FO-3150 facsimile. Press the Function Key the press the Down Arrow three times. You should see a display saying Option Settings. Press the Right Arrow the the Up Arrow three times. You should see ECM Mode in the display. Press the Right Arrow once. You should see 1=Yes 2=No. Press 2 to select No, which will disable ECM. Then Press Stop to return to the date and time display. Most users send ordinary typed documents which do not require the higher resolutions that images or pictures or even legal documents might. By lowering the resolution the amount of data that needs to be transferred is reduced, helping ease the overall transmission. Remember to make sure that the codec your transmission id set to is G711, which is a non-compressed codec.